In December 2014, Yosep Siep was hospitalised for chest and ear pains endured as a result of torture he faced on arrest and in detention. According to defence lawyers, Siep seemed unable to concentrate when answering questions and seemed to be under tremendous stress. 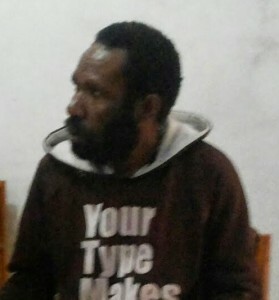 Shortly after, he was declared unfit to stand trial as the psychological treatment he needed was not available in Wamena. Siep has since returned to his home village in Pisugi district, Wamena. During court hearings in March, the remaining four detainees detailed their experiences of torture in detention. Police Brigadiers Endy, Alex Sianturi and Yeskel F.M. who were questioned in court denied that they tortured or ill-treated the five detainees. On 1 April, Ibrahim Marian, Marsel Marian, Yali Walilo and Michael Marian were each given a one-year prison sentence. Prosecutors had previously called for a sentence of five-year imprisonment for the four men.